Celebrate your favorite team and your favorite pastime while you snack. Celebrate your favorite team and your favorite pastime while you snack. Each bat is laser-engraved with details that will remind you of classic bats, affirming your "Genuine Fan" status along with your choice of personalization: Just your team, or your team and your own name as well. The bat is crafted from ash wood—the same material used to make most Major League bats—and the ball is made from recycled aluminum, with thoughtful textured stitching. Whether you're watching solo or in a small group, it's a fun way to snack all season long. Wood bat server made in Dorset, Vermont. Recycled aluminum bowl cast in Mexico. Major League Baseball trademarks and copyrights are used with permission of Major League Baseball Properties, Inc. MLB reserves the right to reject inappropriate material that is submitted for inclusion in the Licensed Products. Each bat is laser-engraved with details that will remind you of classic bats, affirming your "Genuine Fan" status along with your choice of personalization: Just your team, or your team and your own name as well. The bat is crafted from ash wood—the same material used to make most Major League bats—and the ball is made from recycled aluminum, with thoughtful textured stitching. Whether you're watching solo or in a small group, it's a fun way to snack all season long. Teak oil, North American native wood (natural source materials), and recycled aluminum. The Personalized Baseball Snack Server is packaged in a partially recycled and recyclable/compostable corrugated box, with partially recycled and recyclable/ compostable paper fill. 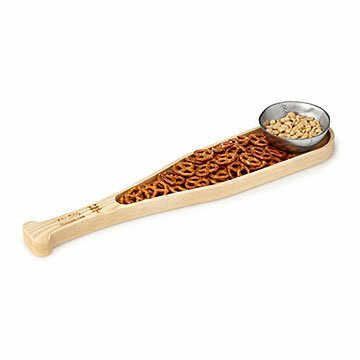 There's one place—and only one place—where you'll find the Personalized baseball Snack Server: UncommonGoods. Board: Wash with warm soapy water and dry immediately. For long term care, apply mineral oil or beeswax wood conditioner every few months. Bowl: Hand wash only, dry immediately with soft cloth. Haven't given this yet but can't wait to see his face when he opens it - he will love the Orioles logo!